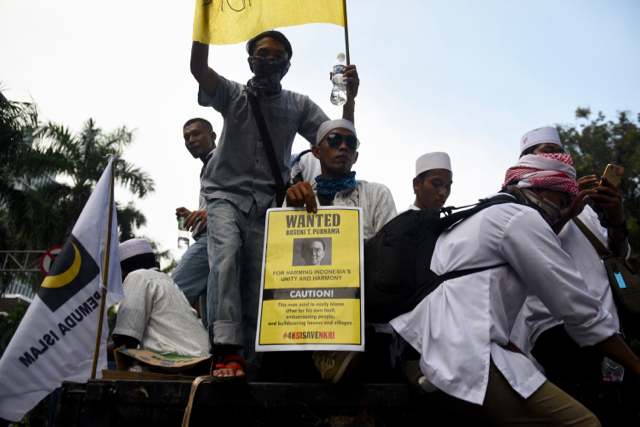 JAKARTA – One protester died and several were injured after tens of thousands of Muslims flooded the streets of Jakarta to protest against the city’s Christian and ethnic Chinese governor after allegations that he insulted Islam. President Joko Widodo said after midnight that he was “disappointed” by the violence — demonstrations that raised fears that anti-Chinese sentiment, which erupted in deadly violence in 1998, could once again flare. Widodo urged the protesters to disperse, saying that the accusations against the governor, Basuki Tjahaja Purnama, would be handled by the police. “The demonstration shows that this can easily be mobilized, especially among the poor in Jakarta,” said Charlotte Setijadi, an expert on Chinese Indonesians at the Institute of Southeast Asian Studies in Singapore. An estimated 2% to 3% of Indonesia’s 250 million people are of Chinese descent, and though prominent in business, they have historically been weak politically. Rumors spread Friday that the city’s ethnic Chinese community could be targeted by angry mobs, with police struggling to curtail a group of protesters trying to break into the governor’s residence in the north of the city. At sundown a group of demonstrators charged police barricades near the presidential palace while others threw stones and bottles. The Associated Press, quoting Jakarta police spokesman Awi Setiyono, reported that one elderly man died during the protests, possibly from the effects of tear gas. The protesters apparently were angered that Widodo, an ally of the governor widely known as Ahok, would not meet them in person to discuss their demand that he resign. Ahok, known for his outspoken manner, has apologized for remarks in which he allegedly said that his political opponents were misrepresenting the Koran by urging Muslims not to vote for him. Ahok’s contrition has not satisfied those who contend that the powerful governorship should be off limits to non-Muslims. 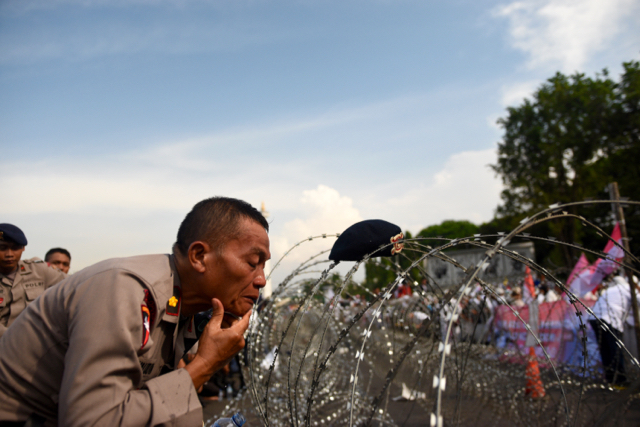 After the clashes near the presidential palace, several thousand protesters marched to Indonesia’s parliament building, six miles south. On Friday evening, local TV showed images of police firing tear gas after protesters tried to charge barricades around the palace, a violent culmination to a demonstration that started peacefully after lunchtime prayers at the city’s biggest mosque, where protesters congregated before marching to the presidential palace. Earlier in the day, police officers had handed out candy to passing protesters, some of whom went around in pairs picking up trash and exhorting fellow protesters not to step on street-side flower banks or grassy knolls. 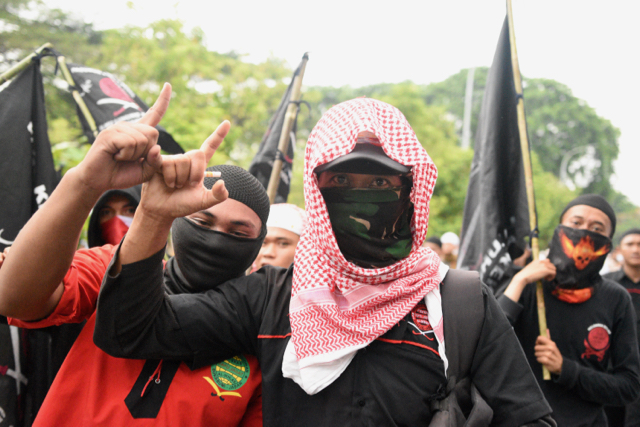 But there were concerns in the days beforehand that hard-liners in the crowd could turn violent or that the demonstration could lure terrorists. 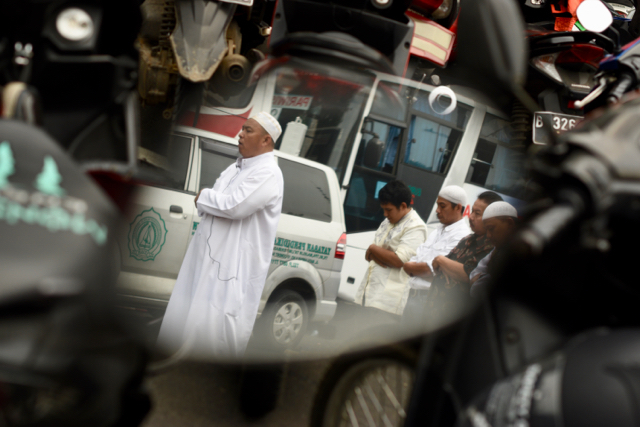 Seven people were killed in January, including five attackers, when gunmen and suicide bombers stormed a busy Jakarta intersection in a sortie claimed by Islamic State. Around 90% of Indonesia’s population is Muslim, the biggest Islamic population of any country, and the variant of Islam practiced across the country’s 17,000 islands is typically described as “moderate.” Political protests take place regularly across the scattered archipelago, which is regarded as the most stable democracy in Southeast Asia. Ahok is standing for election early in 2017, hoping to retain the governorship he won after his predecessor, Widodo, was elected president in 2014.